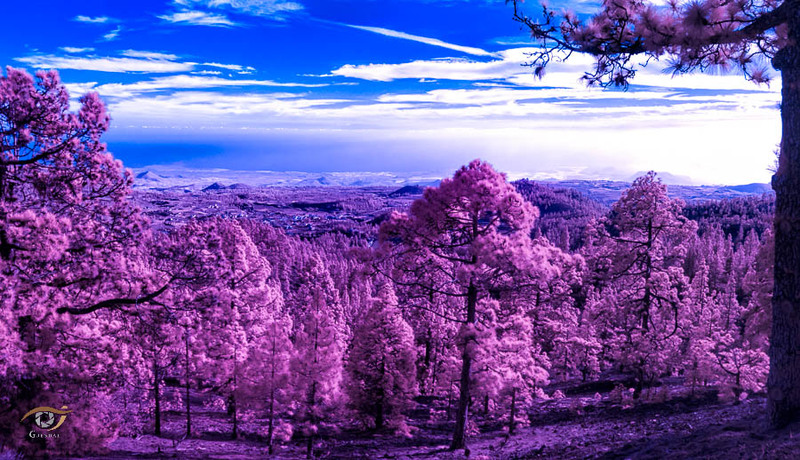 True infrared photography can be done either with a camera that has been modified or a standard camera where one use a filter to block out the normal visable light. There are two very obvious drawback of having a camera converted to be a dedicated camera for infrared photography. Panorama shot, 2 images stitched. I have had two cameras converted to infrared photography. The cameras were converted by lifepixel.com. I have no affiliation with them. I did some research and they seemed like a good company, no problem shipping my cameras from Norway to them and they shipped the modified camera to me with no issue, so when I got my second camera I saw no reason to change. The first camera I got converted was a Panasonic G2. This camera I got quite cheap, in fact, it cost more to convert it than what I got it for. This one was converted with what Lifepixel calls Super Color IR Filter. Provides for a super vibrant foliage and intensely colorful sky. With the red & blue channels swapped the foliage takes on a golden orange tone and sky a beautiful royal blue. The most surrealistic, color infrared filter available. You may be surprised to know this IR filter is also great for black & white IR photography, especially if you want full control of all the elements and love tinkering in Photoshop. The Second camera I got converted was a Nikon Coolpix P6000. The reason I got this was I wanted a smaller camera, that shot raw and had GPS. The GPS on this camera turned out to be terrible, so it’s rarely been used. I wanted a different conversion on this one so I went with their Super Blue conversion option. This is our 1st patent pending color infrared filter that allows you to capture color IR images with the blue sky straight out of camera without the need for Photoshop channel swaps. Its very unique as it behaves completely differently than all other infrared filters because it actually has 2 distinct pass bands. The super blue filter passes blue light as well as infrared light thus allowing for super saturated blue skies straight in camera! Another great side benefit is it’s transmission of ultraviolet light making it possible to also to photograph UV light with a proper external UV only filter to block the rest of the spectrum. One can also use an external filter to block the blue wavelengths and photograph infrared light, similar to our Standard IR filter. With the converted cameras I find that my infrared photography is have a potential that is so much larger than just landscape photography. I find it very interesting to see how the different fabrics turned out, even if they’re nearly same color to our eyes. If you ask me if infrared photography is worth getting into then I would absolutely recommend it, but as with most things in photography, it does take work to get good results.